Today was our last day in Uzbekistan, despite being pretty tired and homesick for my own bed I wasn’t looking forward to leaving this wonderful country. I felt like we had seen and done so much but there was still so much left to discover – I could have done with another couple of weeks!!! 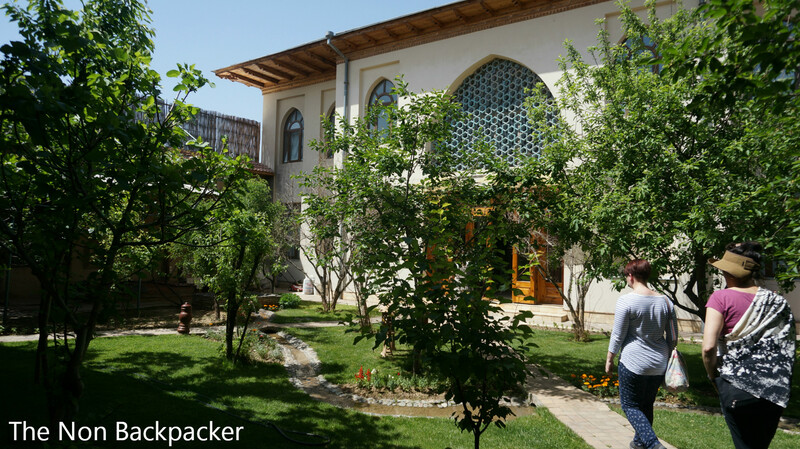 We had one final morning in Tashkent before we departed for the airport and home. Our first stop was a trip onto the metro system to see the mystical stations which you aren’t allowed to photograph. 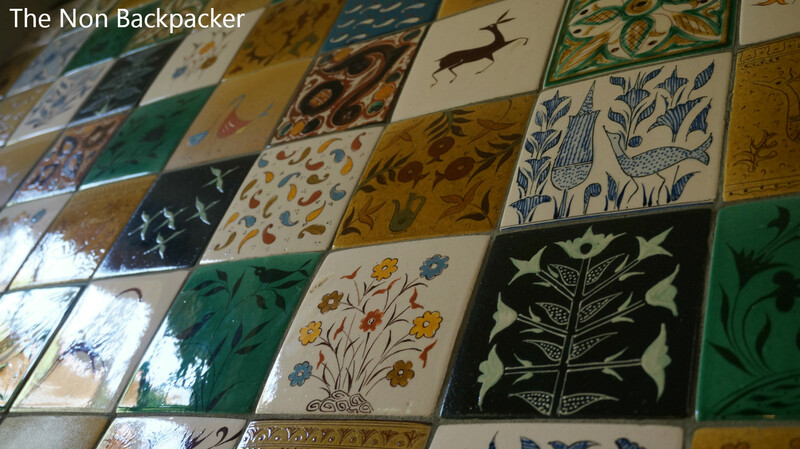 They are a part left over from Soviet rule and contain ornate paintings and chandeliers. We travelled a couple of stops along the line and exited at the Kosmonavtler station. 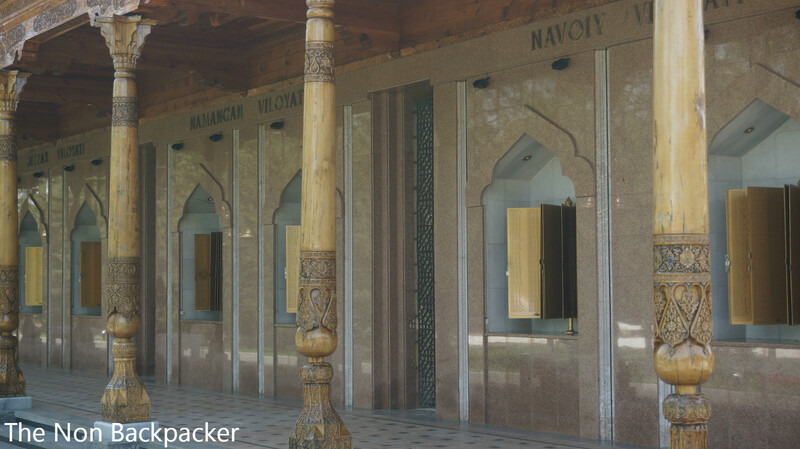 The Metro (the only one in Central Asia) consists of 3 lines and 29 stations all decorated differently to reflect their names. The station we visited gives a clue in its name to the Astronauts it depicts. As you made your way along the platform there are ornate pictures of cosmonauts. I must say that I didn’t quite understand the rule about not taking photo’s, I wonder if this is a little left over from the soviet rule. I also felt a little underwhelmed with the stations. I don’t know if that’s because we only really visited one and maybe that one isn’t one of the best but I didn’t feel they were what they were hyped up to be. I would have liked to travelled to a couple more the stops to really get a feel for them. 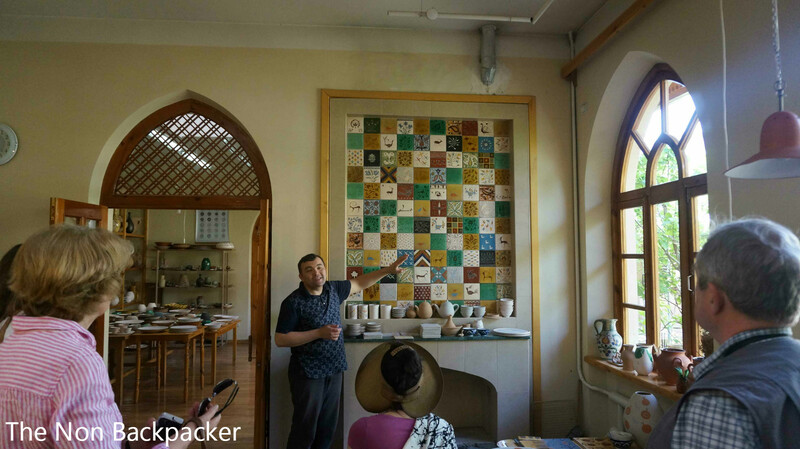 We then took a short bus ride to the ceramics house of Rakhimov. 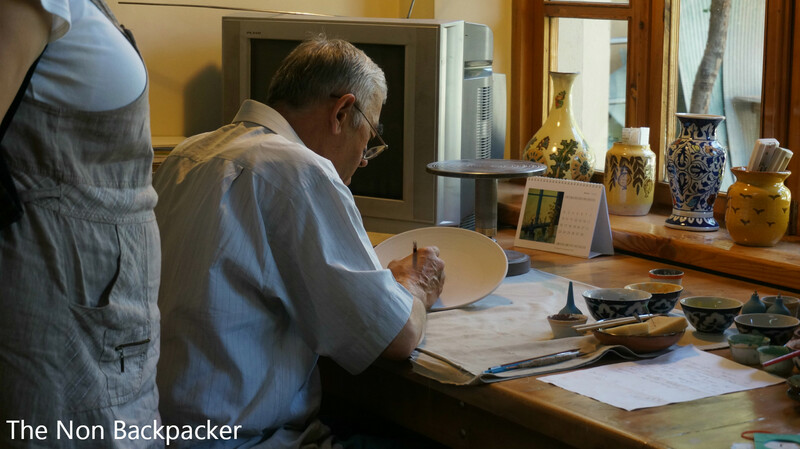 His son showed us around the workshop and talked us through the process of how they make ceramics. 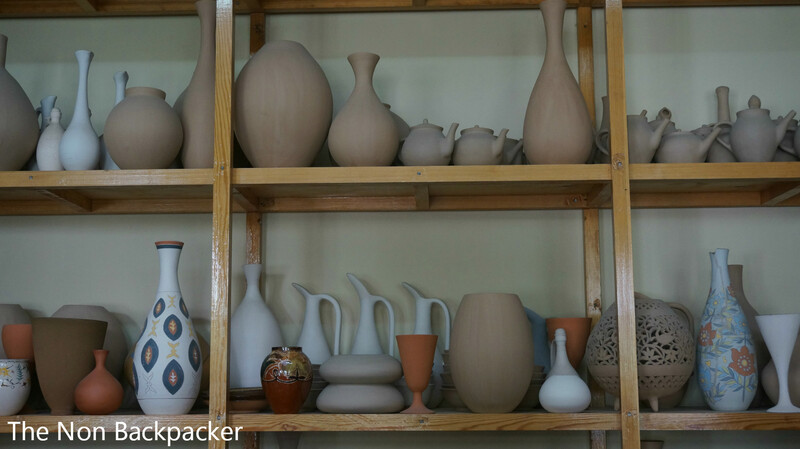 They also offer accommodation for travelling ceramicists to use their facilities and gain inspiration from their courtyard garden. It was utterly beautiful and exactly what you would want from a calming inspirational garden, with fruit trees, grape vines and small streams. 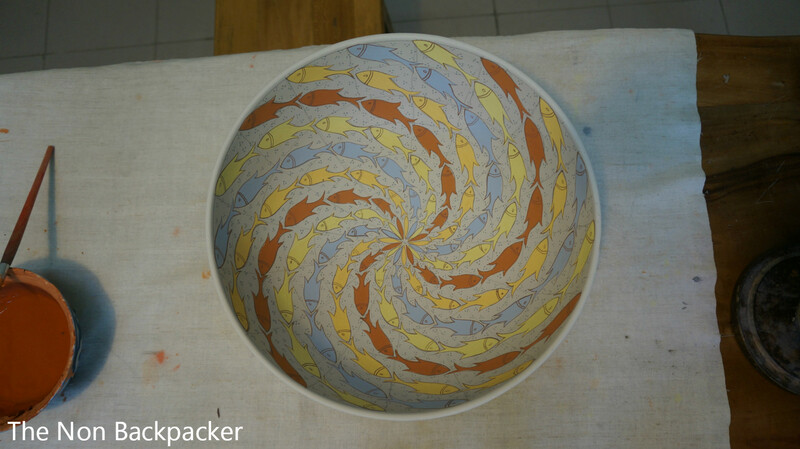 You could see this reflected in the ceramics made on the site. 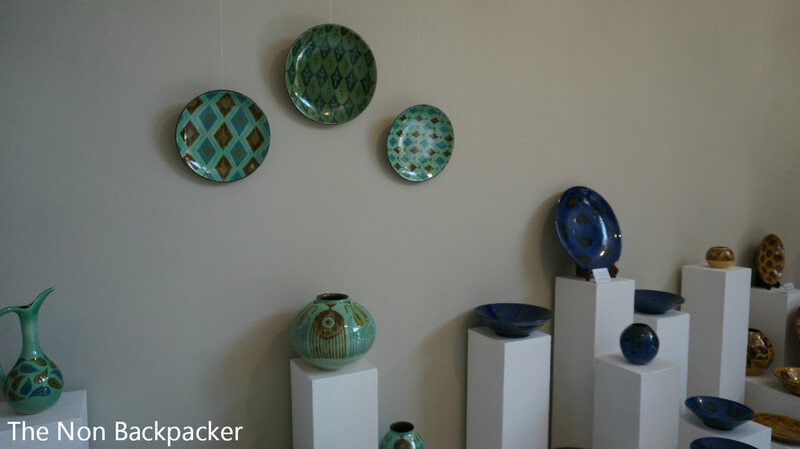 We took a peak in the showroom (Stuart got told off for taking pictures) and I must say they are perhaps best ceramics I have ever seen, and definitely what we saw on our trip. 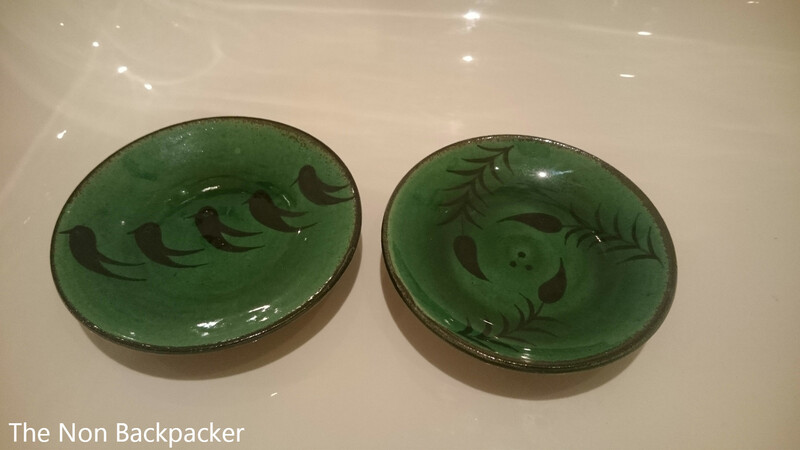 They were beautiful – I slightly fell in love with a copper stain they used to make the plates/vases etc this deep shade of green. Luckily they sold the test plates they use to create the designs otherwise I think I would have cried if I couldn’t purchase something. I would have loved a giant plate to hang but we were already on borrowed bag space!!! 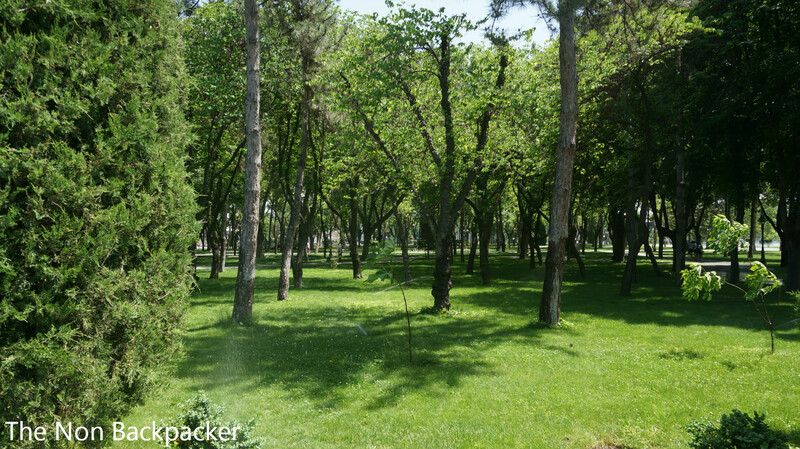 Our last stop of the day was a walk through the Navoi Park which was busy with children on a school trip. The park was getting ready for a WW2 memorial day so some sections were cut off but we still got a peek at the Glory and Memory alley (galleries decorated with books listing the names of those who lost their lives in the war) and the statue with the quenchless flame. We walked up to the Independence Monument. 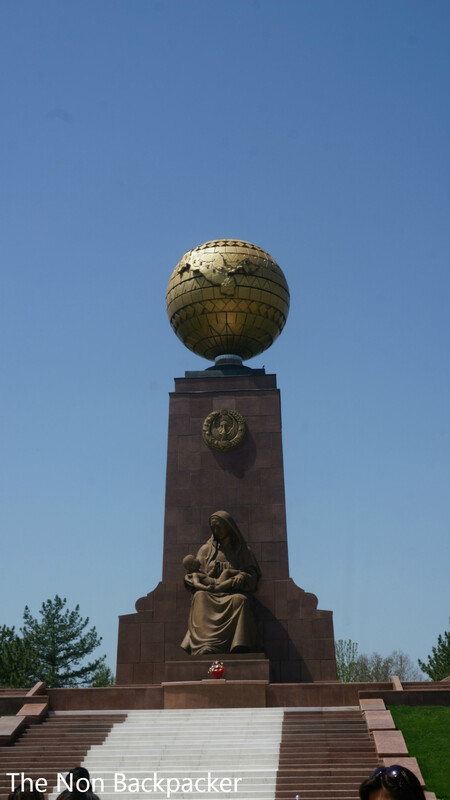 A statue depicting a mother holding a child and Uzbekistan on a globe. 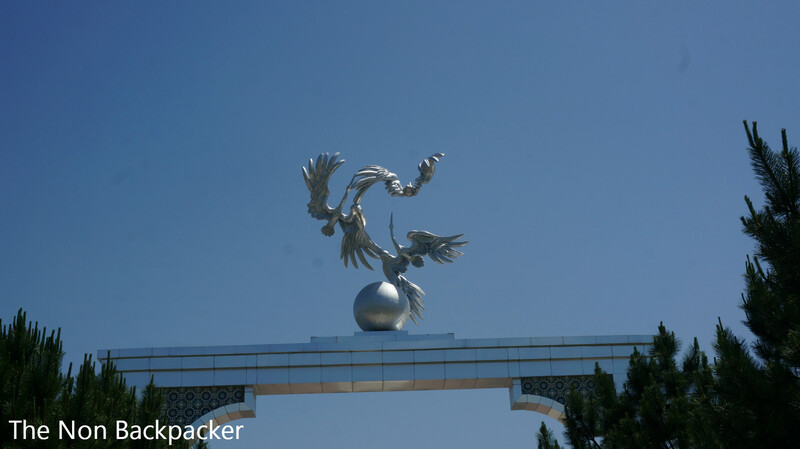 Its was to signify Uzbekistan being its own country and showing its place in the world. It was a pretty good statue. The statue was at the end of Independence Square with marble columns with storks at the other. Independence Square changed name from Lenin Square after independence in 1991. It is now used for national events and is surrounded by government buildings. The whole area is very well kept, our guide told us how you weren’t allowed to picnic in the park on the grass, if it had been in London it would have been covered with people in good weather. The tree’s – fir tree’s so not totally suited to the climate – were very well watered and so the whole area was very green. 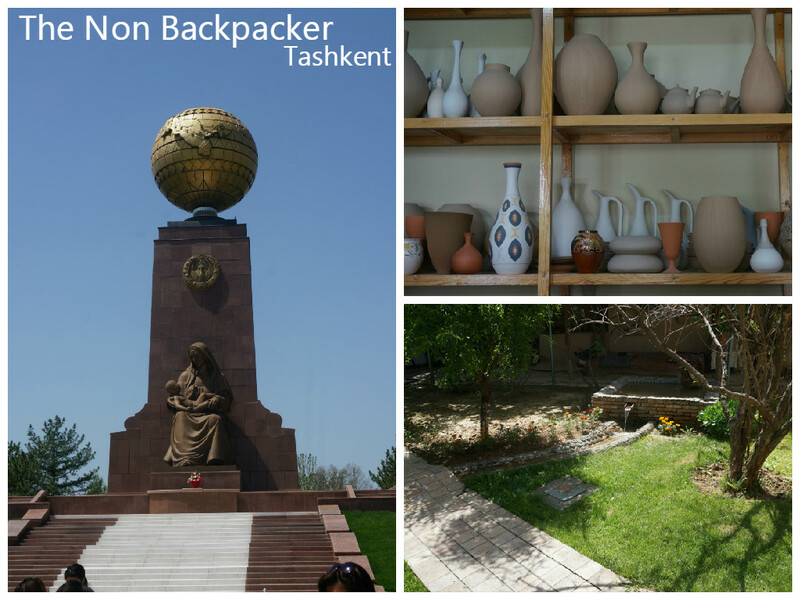 We stopped for a quick lunch then headed to Tashkent airport and our flight home. Getting through immigration on the way out was fun, I got through fine and was left waiting on the other side for what felt like ages as Stuart was interrogated by several immigration officers about his passport and who he was as they didn’t believe it was his! Eventually they let him through but it was a bit tense! The rest of the time went without a hitch and we were safely home 12 or so hours later – exhausted but exhilarated and perhaps, at least for me, a changed person with a new outlook. 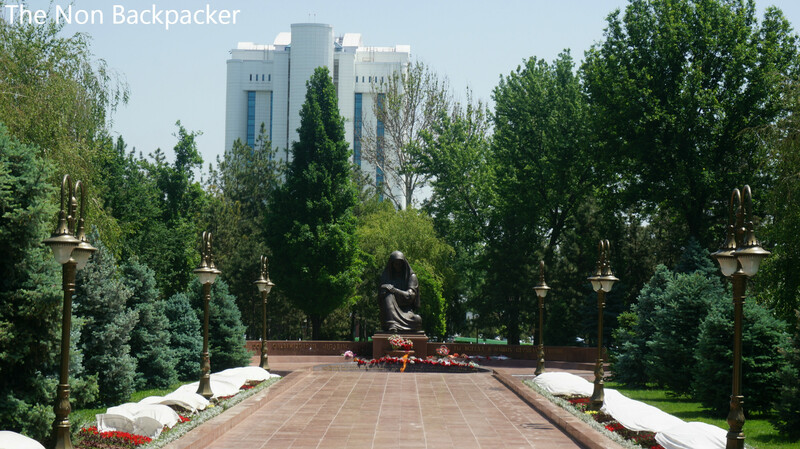 Keep an eye out for my final Uzbekistan post with my top 5 and my final thoughts. Have you ever been anywhere and come away a different person?